Who said art has to be expensive? This would've worked well back during my Quirky Art Month, but I wanted to share it now anyway. 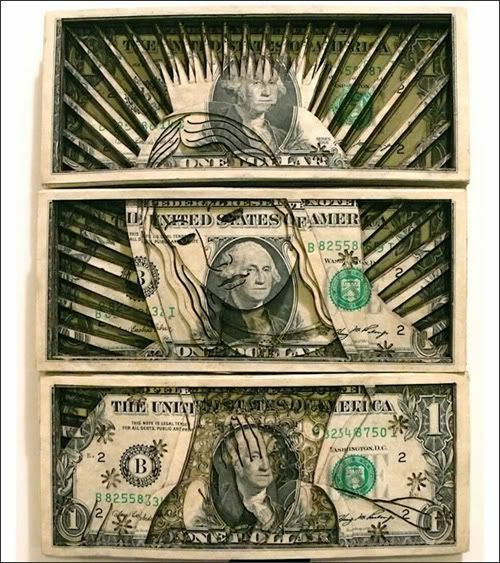 Caroline has more pictures of the dollar art, where Scott Campbell laser-etched his designs into stacks of $1 bills. While I thought the idea was quirky, when I followed her link to Campbell's website, it turns out he's a tattoo artist, too....and has some beautifully done tattoos that you might want to look through.